Hyster builds the popular Fortis range of forklifts, from 1.5t to 3.5 tonnes. 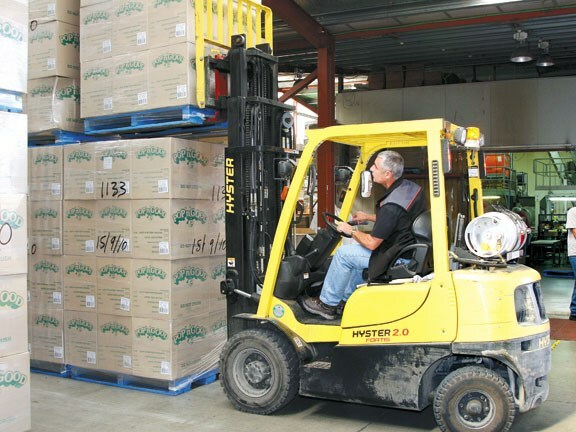 Davies Foods' Te Awamutu site has a 2006 Hyster H2.0TX Fortis forklift with almost 2500 hours on the clock from operating on a site with two 12-hour shifts per day, in a four-day working week. Operations manager Martin Kwan says the Hyster works around eight hours each day, approximately 32 operating hours a week for both shifts. The Hyster is employed to move packaging, corn and general ingredients. All of the operating controls are directly in front of the driver in an uncluttered format. The levers are in good positions and provided good feel when working the 3000mm maximum height two-stage mast actions. The handbrake is positioned on the left consol where it's visible and easy to get at. The Hyster fork hoist has a fairly open platform, making for one relatively easy step up to the seating position. The seat itself is in/out adjustable, also with an adjustable seat back. There's also a dial to adjust the spring tension to the weight of different operators. The tiltable steering wheel allows you to adjust the wheel position to suit yourself. A small digital dash blends nicely with the steering column, which mounts a relatively small diameter steering wheel. A pair of good sized rear view mirrors help for monitoring behind, and to the driver's right is a very handy clip to place despatch dockets. The Hyster H2.0TX is highly manoeuvrable thanks to its typically good steering lock, however during the last 20% or so of power steering travel, I noticed the engine struggle to maintain its revs as the hydraulic power steering pump worked overtime when approaching full lock. 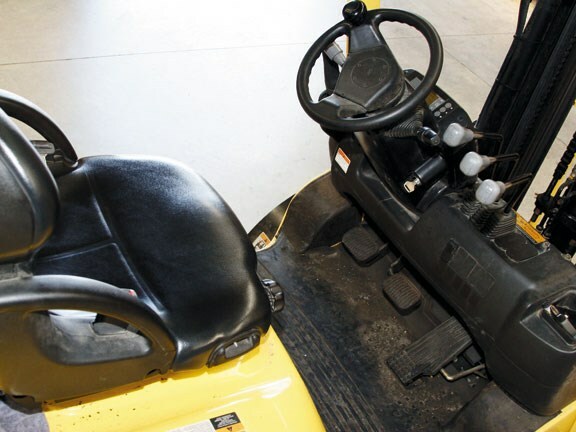 Kahu Pora has been a regular driver for the past six years and loves the power steering and comfort of "his" forklift. He also really likes the swing out and then tilt-down LPG bottle "EZXchange" jig for easier bottle removal. He agrees the optional side-shift is a big help to better position the forks under pallets, which I also found during my drive. For his next Hyster, Kwan would like to fit a load weight display to measure incoming and outgoing loads. Hyster's optional Load Weight Display senses the hydraulic pressure in the lift circuit to estimate the load being lifted. The four cylinder 1998cc Mazda petrol engine produces a maximum of 33.8kW of power at 2100rpm, and 137Nm of torque, at 1600rpm. The diesel powered option uses a Yanmar powerplant. The Davies Foods' LPG H2.0TX ran very quietly, and opening the rear-hinged engine compartment door for maintenance took just 30 seconds. See a range of Hyster forklifts for sale.